When you press and hold the Custom tool icon in the Toolbox, Sketchpad displays the Custom Tools menu. •Use the first part of this menu to create and organize your custom tools. •Use the bottom command on this menu to choose a Tool Folder in which to store frequently-used custom tools. Hold the Alt key (Windows) or key (Mac) when you pull down the Custom Tools menu to use one of the listed custom tools as a command. Hold the Shift key when you pull down the Custom Tools menu to show the Script View as you choose a listed custom tool. To define a new tool or organize your tools, press and hold the Custom tool icon and use these commands. Create New Tool: This command allows you to make a new custom tool based on your selections in the sketch. Tool Options: This command displays the Tool Options dialog box. Use this dialog box to organize, rename, copy, or remove the custom tools contained in your sketch. To choose a tool, press and hold the Custom tool icon and choose a tool from the middle part of the menu. This Document: This section of the menu lists all of the custom tools defined in the current (active) document. If the active document does not yet contain any tools, this part of the menu does not appear. When you define a new custom tool, it appears first in this part of the menu. Other Documents: This section of the menu lists all of the other open documents that contain custom tools. Each entry in this part of the menu lists an open document that contains tools and displays a submenu of each of the tools in that document. If no other open documents contain tools, this part of the menu does not appear. Tool Folder: This section of the menu lists any tools from documents that were stored in your Tool Folder when you started Sketchpad. 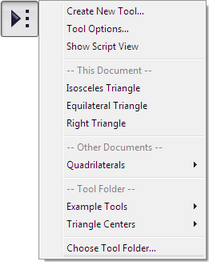 This part of the menu appears only if you've chosen a Tool Folder within which there are documents containing tools. Once you’ve chosen a custom tool, it becomes active until you choose a different tool, just as if you’d chosen the Compass or Straightedge tool. If you want to use the same custom tool several times in a row, you don’t need to choose it again from the Custom Tools menu. Just keep using it. If you’ve switched from a custom tool to some other tool, such as the Arrow tool, you can switch back to the last custom tool you used by clicking — rather than pressing and holding — the Custom tool icon. This activates the most recently chosen, checkmarked tool. If you want to switch to a different custom tool, press and hold the icon to display the Custom Tools menu. To show the Script View at the same time as you choose a custom tool, hold the Shift key when you pull down the Custom Tools menu. Use the Choose Tool Folder command to choose a Tool Folder in which to store frequently-used custom tools. When you store custom tools in this folder, they become available in the Tool Folder section of the Custom Tools menu. Hold the Shift key while pressing the Custom Tool menu to change the Choose Tool Folder command to Forget Tool Folder. Use this command to have Sketchpad forget about the current Tool Folder.